chickpeas, chin chin, namkeen and so on. 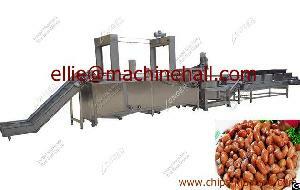 1.This machine is widely used in food snack frying process factory, restaurant, hotel, etc. It applies to fry pellet chips, potato chips, banana chips, meat pie, chicken drumstick, chicken cutlet, fish cutlet, fish, shrimp French fries, peanut, vegetables, etc.